September 24, 2017 at 4:08 pm. Nothing is more treasured to a college football team than experience at quarterback. Well, at least that used to be something people said. More true freshmen quarterbacks than ever are arriving at the intersection of Readiness and Opportunity, and we’re only a season removed from one such player — Jalen Hurts — taking mighty Alabama to within a play of the national championship. As this season takes shape after four full weeks, true freshmen quarterbacks are influencing several major programs, which means their young minds and mettle, arms and legs, will hold sway over Power 5 conference races and, therefore, the College Football Playoff and the national title. Which brings us to Georgia. True freshman Jake Fromm — handed the reins after one of last year’s crop of true freshman quarterbacks, Jacob Eason, suffered a knee injury in the opener — helped guide the Bulldogs to a 31-3 rout of No. 17 Mississippi State on Saturday. 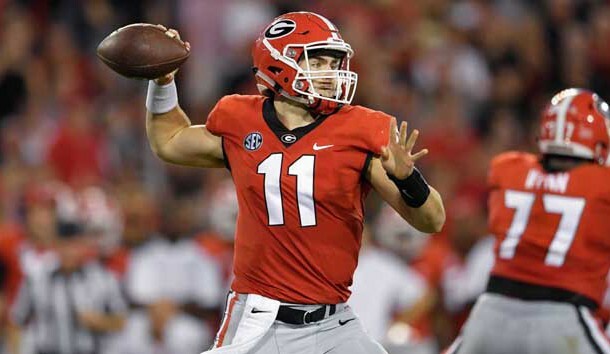 Georgia (4-0) has emerged as the clear favorite in the SEC East and a legit threat to top-ranked Alabama in a potential SEC title game matchup. The Bulldogs have a great rushing attack, a veteran and fearsome defensive front seven … and Fromm, rated the No. 3 pro-style quarterback recruit in the nation in the 2017 class, according to the 247Sports composite rankings. Fromm was 9 of 12 for 201 yards and two touchdowns in the team’s complete effort against Mississippi State. One of the incomplete passes was a throw-away. The others were drops. Fromm’s first pass of the game was a 59-yard touchdown strike to receiver Terry Godwin off a flea-flicker. With the rise of quarterback summer camps and clinics and coaching “gurus,” more recruits than ever come in with a reasonable readiness to make the jump to hyperspace. Other true freshmen quarterbacks thrust into big-time opportunities in the first month are Florida State’s James Blackman (first career start in a loss at North Carolina State); Texas A&M’s Kellen Mond (325 total yards in an overtime victory over Arkansas) and Texas’ Sam Ehlinger (nearly pulled off the upset at USC two weeks ago. And over at Alabama, true freshman backup Tua Tagovailoa is waiting — and quite possibly ready, given his relief effort in Saturday’s rout of Vanderbilt — should Hurts be hurt. Fromm leads the young pack for now, rated 10th nationally in passer efficiency with a rating of 172.0. Eason — one of the “flavors of the month” last season as a true freshman — has yet be to medically cleared to return to game action, but he’s getting closer. He won the job through spring and fall competition, but Fromm always intrigued because of his skill, vocal leadership and decisiveness. Eason might not get his job back. 1. Gary Patterson is at it again. TCU has an occasional down season but always bounces back with a vengeance. The Horned Frogs followed losing records in 2004 and 2013 with one-loss seasons, and Patterson’s crew — 6-7 in 2016 — stamped itself as legit big-prize contenders with a 44-31 victory at then-No. 6 Oklahoma State. 2. Florida is living right. The Gators are 2-1, but needed divine help in beating Tennessee on a Hail Mary two weeks ago and got another gift Saturday, when a holding call on Kentucky in the final seconds pushed the Wildcats beyond the edge of field goal range; a last-play 57-yard fell just short. The Gators beat Kentucky for the 31st consecutive time. 3. UCLA is too soft on defense. QB Josh Rosen always intrigues, but his I-have-to-do-it-all bad habits are only being magnified by a defense that gave up 44 points to Texas A&M, 48 to Memphis and 58 to Stanford. The Bruins are last nationally among power conference teams, allowing 524.8 yards per game. 4. Michigan’s QB battle is one to watch. John O’Korn hasn’t been able to wrest the starting job away from Wilton Speight in the past couple of seasons, but there’s nothing like game time to change minds. O’Korn was effective Saturday after Speight left in the first quarter due to injury, sparking four touchdown drives in a 28-10 victory over Purdue. 5. Central Florida enters battle for big bowl. Perhaps everyone had the wrong Florida “directional” school as the best from the Group of Five conferences. South Florida is moving along at 4-0, ranked all season, but UCF is surging under second-year coach Scott Frost, whipping Maryland 38-10 on the road Saturday. Central Florida and South Florida meet at the end of the regular season in an East Division showdown in the American Athletic Conference. 1. RB Saquon Barkley, Penn State. He moves quickly and effortlessly along every axis — including vertically if he has to hurdle a defender — and he just refused to be bottled up against Iowa, putting up 358 all-purpose yards in the Nittany Lions’ 21-19 thriller. 2. QB Baker Mayfield, Oklahoma. The senior leads the nation in passing efficiency with a rating of 228.3, and his 13-0 touchdown-to-interception ratio is a nifty part of that. 3. RB Bryce Love, Stanford. He’s the nation’s leading rusher — and averaging 10.78 yards per carry — and he’s doing it while playing for a Cardinal team that lacks a complementary passing game. His speed and quick cuts carved up UCLA for 263 rushing yards Saturday night. 4. RB Rashaad Penny, San Diego State. The Aztecs’ 28-24 win on a rainy day at Air Force is probably more impressive than you think, and Penny led the way with 128 yards and three touchdowns. 5. QB Lamar Jackson, Louisville. The 2016 Mr. Heisman is still the most exciting quarterback in college football. 2. Eastern Washington often has one of the most prolific offenses in the Football Championship Subdivision, and the Eagles are at it again as Gage Gubrud passed for a school-record 549 yards Saturday in a 48-41 victory over Montana on Saturday. 3. Old Dominion true freshman quarterback Steven Williams Jr. became the second-youngest starter in the history of the Football Bowl Subdivision. The 17-year-old completed just 8 of 26 passes in a shutout loss to Virginia Tech. 4. As expected, the game between rivals St. John’s and St. Thomas, played Saturday at the Minnesota Twins’ Target Field, set a Division III attendance record of 37,355. The Tommies beat the Johnnies 20-17 in this battle of D-III heavyweights. 5. North Carolina State defensive end Bradley Chubb apologized for spitting on the Florida State midfield logo after the Wolfpack’s upset of the then-No. 12 Seminoles. As far as postgame antics in hostile stadiums, we’re ranking them like this: 1. Baker Mayfield planting the Oklahoma flag in the Ohio State turf. 2. Penn State QB Trace McSorley punting the ball after taking a knee at Iowa. 3. Chubb. 1. Clemson at Virginia Tech (Saturday, 8 p.m. ET) — A rematch of last season’s ACC Championship Game and a potential preview of the 2017 title tilt. The Hokies have pitched two shutouts this season and found a dynamic quarterback in redshirt freshman Josh Jackson. 2. USC at Washington State (Friday, 10:30 p.m. ET) — Martin Stadium is going to be insanely rocking on a Friday night in the kind of home spotlight that rarely shines on Pullman. This will be a full-on blast of #Pac12AfterDark. 3. Georgia at Tennessee (Saturday, 3:30 p.m. ET) — Last season’s meeting was one of the nuttiest of the season, with dueling touchdowns in the final 10 seconds, including the Vols’ final-play 43-yard touchdown pass for a 34-31 shocker. 4. Miami at Duke (Friday, 7 p.m. ET). A worthy Friday night undercard to USC-Washington State, with the Hurricanes putting their 2-0 record on the line vs. surprising 4-0 Duke, led by sophomore quarterback Daniel Jones. 5. Ole Miss at Alabama (Saturday, 9 p.m. ET). This probably means nothing for this year, but the Rebels beat Alabama in 2014 and 2015, and lost by just five last season, 48-43. Worth keeping an eye on to see if Ole Miss quarterback Shea Patterson can threaten the Tide’s D.